The Federal Government, UN Development Programme (UNDP) and Japanese Government have launched a new project to support early recovery activities in the North-East of Nigeria. UNDP’s Head of Communication Nigeria, Mr Lucky Musonda, disclosed this in a statement, on Friday, in Abuja. Musonda said that the project was launched following the release of 1,036 million dollars by the Government of Japan. The pop star was pictured on a beach in Rio de Janeiro, Brazil showing off part of his torso in a tank top rolled up to form a crop look paired with vibrant althleisure pants over white sneakers and over sized clear glasses. The Nigeria Football Federation (NFF) is making frantic efforts to pay the Super Eagles coach Gernot Rohr his salary arrears, The Punch reports. Controversial journalist Kemi Olunloyo has been remanded in prison for the second time in two weeks. On Thursday, March 30, she was granted bail by a magistrate court in Port Harcourt but was sent back to prison by a Federal High Court also in Port Harcourt. 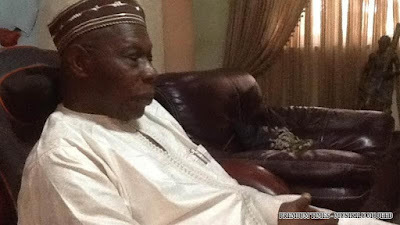 Former President Olusegun Obasanjo has revealed how God made him build a church during his incarceration at Yola Prison and later won the souls of several inmates including a notorious robber/murderer who later became a pastor with Baptist church. Speaking at the Shepherdhill Baptist Church in Lagos, last Sunday, during a Thanksgiving Service to mark his 80th birthday, Obasanjo called on Nigerians to work for God no matter the circumstances they find themselves. Dino announced this via his twitter handle this morning. Last week, he filed a N5 billion cyberstalking lawsuit against the Sahara Reporters publishers at a Federal High Court in Abuja. The European Court of Justice (ECJ) on Tuesday ordered that a travel ban imposed on the daughter of former Libyan leader Moamer Gaddafi be lifted. The EU had imposed sanctions during the Libyan revolution in February 2011, banning Gaddafi and members of his family from entering or transiting through EU member states. However, the travel ban was renewed in June 2014. The ban was challenged by Gaddafi’s daughter Aisha, who currently lives in Oman with her family. The ECJ said that the European Council had justified the ban by citing the involvement of Gaddafi loyalists in the use of force, repression and violent attack against civilians. The court found that not enough information as to Aisha Gaddafi’s “individual, specific and concrete role,” was made available to support the ban. Seyi Law: Why i Didn't Sleep With My Wife On Our Wedding Night! Yesterday, the couple celebrated with beautiful photos their wedding anniversary and included their six-month-old baby, Tiwa. A group of Muslim women linked hands to form a human chain over Westminster Bridge this weekend, in a show of solidarity with the victims of the terror attack that took place there on Wednesday. The women, who were there with their daughters, friends, families and supporters, held hands and observed a five-minute silence as Big Ben struck 4pm. A stepfather killed his two-year-old girl by throwing her into a door after getting frustrated because he lost a computer game, police say. Medical NGOs mounted a new legal bid Monday to break a US pharma giant’s hold on a hepatitis C drug whose price — costing thousands of dollars for a typical course — has unleashed a fierce patent battle. Adele is currently packing out stadiums down in New Zealand as part of her latest tour, but if what she has to say is anything to go by, she won't be doing too many more globetrotting gigs in the future. The CBN said it will sell to banks at 357 naira per dollar. Banks are to post the new rates in the banking halls of their branches immediately. CBN will also send examiners to banks to ensure the new rates are implemented. Banks are prohibited from selling FX funds meant for invisibles to BDCs. On Sunday, March 26, Chiamaka Chukwurah emerged the queen at Sisi-Oge 2017 contest held at prestigious Civic Centre, Victoria Island, Lagos. According to a report by the Daily Guide which is making rounds on social media, one of the vehicles is a Toyota Land Cruiser V8 which he was allegedly caught with at a spraying shop in Accra where he had taken it to be resprayed. The vehicle is said to be one of the 200 vehicles the presidency says are missing. The report further said Dumelo initially said that the former first lady, Lordina Mahama, gave him the vehicle after which changed his tune, saying that he bought it himself. After a titanic warfare between the Nigerian Union of Teachers (NUT) and the Delta state government that lasted for two weeks, the state leadership of the NUT has finally come to a truce with the government and suspended the strike. Nigeria's central bank kept the main interest rate at 14 percent as expected on Tuesday and pledged to close the gap between the official and black market exchange rate. The Amazing Grace Foundation Old People's Home in Kado Estate, Abuja on Friday, March 17, received special visitors. President Muhammadu Buhari yesterday ordered security agencies to investigate and prosecute the yet unknown gunmen who attacked a market in Zaki Biam, Benue State on Monday and killed several persons. The president condemned the attack as wicked, the same with similar wanton killings in other parts of the country, and challenged security agencies to up their game and checkmate the tragic situation. 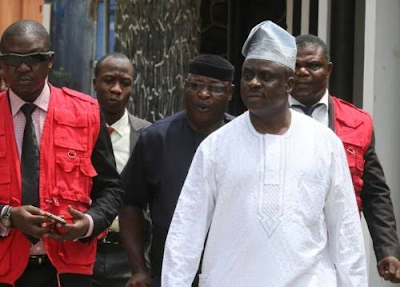 EFCC has handed over a $2.15 million hospital owned by former Chief of Air Staff, Air Marshal Adesola Amosu (retd.) to the Nigerian Air Force authorities. "Why I Will Not Honor Senate's Summon"